Five years ago, I decided that rather than continue to use Tumblr to blog about comics and music, I’d move what stuff I’d posted there over to a new WordPress site with a new name and try to be a little more rigorous in my interrogation and exploration of these media and their meanings. In part I was inspired by Sounding Out! which I was still contributing to on the regular back then but also by the fact that tumblr is just not a very good medium for longform blogging. My posts were getting longer and longer and I wanted a site that was more easily navigable and archived if I was going to be expending so much time and energy on them. As such, The Middle Spaces was born in March of 2013 when I wrote my first post exclusively for the site. Five years later, it is still going strong. As I suggested in my 2017 Year-End Meta post, there is recursive relationship between the increasing number of back issues I hunt down and my desire to write for the blog. In other words, the more back issues I acquire the more I find that I want to write about, and the more I want to write, the more back issues I add to my hunting list. As such, for this fifth anniversary post I wanted to focus on a particular effort to collect a set of comics that I imagine will influence my thinking about comics and thus my writing here and that has been going on the whole time I have been developing The Middle Spaces: re-collecting a run of Uncanny X-Men that matches up with the issues I owned as a kid. As I have written about in the past, my perspective on my own comics collecting and reading practices has changed over time as I have more thoughtfully reflected on my experience with comics. While I used to mark some time in late 1981 as when I “started” reading comics, the truth is I was falling victim to the common conflation of “comics” with “superhero comics.” And while I will still sometimes use the word “comics” as shorthand when I really just mean “comics of the superhero genre,” I try to be more cognizant of how much that leaves out and what a disservice that does to a wide range of comics when used recklessly. In actuality, I cannot remember a time when I did not read comics. In addition to the random issues of Amazing Spider-Man that were a part of my life in the 10 years I was around before 1981, I was a frequent reader of not only comics like various Archie titles and Richie Rich and Casper the Friendly Ghost comics, but from the time I could begin to sound out words I loved newspaper comic strips, gobbling up Blondie, Peanuts, Marmaduke and Gasoline Alley. Later, I’d get into Doonesbury and Bloom County. Nevertheless, my relationship with superhero comics still provides the primary framework for how I think about my reading and collecting. When my regular buying of comics was dwindling as I made my way through high school and my interests changed, it was Uncanny X-Men that I continued to buy regularly. I loved that series, as a lot readers of the time did. It was near the height of its popularity and its increasingly grim take on identity politics and marginalization—despite remaining overwhelmingly white—spoke to me as a kid who grew up with the social turmoil of the 70s and the threat of nuclear annihilation that seemed to color everything during the Reagan Era. The dark future of X-Men’s sentinel-ruled dystopia felt like my own dark present. And yet by 17, even X-Men couldn’t hold my interest anymore. “Regularly” became sporadically, and finally I gave up buying comics altogether by the end of 1988. My disappointment in the increasing regularity with which line-wide events shaped the continuity of the story didn’t help staunch that growing lack of interest either. When the X-Men died near the end of the “The Fall of the Mutants” storyline and then were immediately brought back to life it felt like a bridge too far for me. The resultant resettling of the team in the Australia Outback felt like a belated attempt by Marvel to cash in on the fad for things Australian in America that had happened earlier in the decade, what with the popularity of Crocodile Dundee, Mad Max, and koala bear stuffed animals—the release of Yahoo Serious’s Young Einstein that same year marked the nadir of that fad. Like a lot of fans at one time or another during their time as comics readers, I grew jaded with the industry’s attempts to catch lightning in a bottle. X-Men was a victim of its own success. About 10 years later, I’d go through my comics collection, re-reading large swaths of them, and then arranged the books into lots to sell on eBay. I sold off all of my X-Men comics that way (except for two issues I particularly liked), because in re-reading them I found they did not hold up. Comics I could not sell on eBay I gave to my mom and sister to sell for me at their monthly yard sale and split the profits with them. Some comics I gave away. I sometimes regret selling those Uncanny X-Men issues, but when I remember that I sold most of them to a young guy who explained he was buying a complete run of reading copies for his girlfriend who was really into X-Men, I regret it less. It seems like those comics went to a good cause. Nineteen years later, having rediscovered the joy of comics because I found a new way to read and think about and contextualize them that explodes with more meaning than I thought possible—and beyond the often-oversimplified metaphors and allegories intentionally written into a lot of them—I started hunting down all the Uncanny X-Men again. And I should probably credit the Jay & Miles X-Plain the X-Men podcast, which I have listened to religiously since the first episode premiered, for helping ignite that desire. I’m like Jean Grey; I can’t stay away (even though as the featured image for this post suggests, Rachel Summers was my Phoenix). Now I would have the opportunity to do what I could never afford to do as a kid, fill in all the gaps in my X-Men run and collect issues that run from the earliest issues I can remember acquiring through when I made sure to do my best to get the newest issue off the newsstand every month to the point when I stopped caring. It took me nearly five full years to do it. Part of what took me so long was my refusal to pay more than five dollars for any of those issues. This was fine for the majority of them, but for others it meant hunting for a long time and in some cases making compromises. I’d pay more than $5 for an issue if it averaged below $5 with the others I might be buying in a lot, or if I thought there was a good chance I could sell off duplicates in a lot I won on eBay and make back most of the money. In the end I would have to pay $20 for one issue (including shipping)—Uncanny X-Men #221—but as we shall see, the average per issue cost remained well below five bucks even with that splurge. A snapshot from a page of a little journal I use to keep track of what issues I am looking for from when I was in the midst of the hunt. How Did I Decide What Made This Run Complete? Back in 2014 when I wrote “On Collecting Comics & Critical Nostalgia,” I mentioned Benjamin Woo’s categories of comics collectors—completists, hobbyists, and speculators—and how according to his definition I was a “hobbyist.” His definition is based on Jonathan David Tankel and Keith Murphy’s description of such a collector as “curator, an archivist, and a preservationist for artifacts that have meaning for their cultural lives. The financial investment in preserving these artifacts does not represent any rational cost/benefit ratio if viewed only in a monetary sense. The value received from these artifacts is measured in terms not usually mentioned in the course of mass production and consumption; that is, in aesthetic pleasure and personal satisfaction” (qtd. in Woo 188). I’d like to think that my scholarly work with comics is more than a “hobby,” but I guess that until I get a tenure track job that’s all it’s ever going to really be. Anyway, while my approach to comics collecting is not a speculative one (i.e. looking to make a profit through resale), I do have a completist bent. There is a certain “selective completism” to my approach. Once I determine what constitutes “complete” for a given run for a given purpose—typically built around a particular sense of cultural and/or personal significance—I do what I can to get every issue in that relevant set. That is to say, while I rarely collect based on getting everything connected to particular characters, series, or creators, I tend to collect around particular ideas or eras of a series that determine the bounds of the set. So, what constituted the set of Uncanny X-Men comics I would be hunting down? The first X-Men comic I can remember reading was over the shoulder of a friend in my 5th grade classroom. This would have been in spring of 1982 and the issue was Uncanny X-Men #160 (cover date August 1982). I found the book weird and didn’t understand what the heck was going on. Who was this mostly naked black woman with weather powers? Why were there two of her? Who was Ilyana? Was that Belasco guy the Devil? In truth, none of the answers mattered, what mattered is that I was intrigued enough to start to keep an eye out for X-Men comics at the newsstand and at the yard sales I frequently spent the weekends trolling for cheap back issues with the aid of my older sister. It was issue #168 that really hooked me—a Kitty Pryde centered story. I fell in love with her. At the risk of being reductive, in terms of the imagined straight male pre/teen audience, there are two basic kinds of superhero comic book characters, those the reader wants to be and those they want to have. In the figure of Kitty Pryde eleven-year-old me came upon the first example of a character that was both of those things at once. She was both the kind of ideal fantasy girlfriend that a prepubescent straight boy might imagine but was also super smart and seemed mature for her age and got to hangout with the X-Men. Who wouldn’t want to be that? And while later, Rogue’s angsty alienation and Storm’s self-possession and strength would also make them characters to love and admire, I’d never stop having Kitty for a fave. As such, it seemed to make sense to begin with the introduction of Kitty Pryde (Uncanny X-Men #129), but I also knew that starting there would make putting together the run prohibitively expensive. There was no way I was ever going to find that issue or the issues that make up The Dark Phoenix Saga (#129 to #138) or “Days of Future Past” (#141 and 142) for less than five dollars in any condition that I’d want to bother having. I am not one to care to much about “condition,” but I do insist that any comic I purchase have an intact cover, no major tears, and have legible interior pages with nothing important cut out. Uncanny X-Men #168 seemed like a good start since it was the issue that got me hooked, but I had owned earlier issues when I was a kid, issues I had traded for or found at flea markets. Since some of those like X-Men #98 went too far back and trying to reacquire a copy of my then-treasured Uncanny X-Men #136 led to the same economic concerns as #129, I settled on Uncanny X-Men #144. I had the issue back in the day and it felt like a good post-“Days of Future Past” starting point, especially since I had the issues between #129 and #144 in collected trades, so I owned the series from Kitty’s introduction in some form. That probably raises the question, why insist on getting single back issues at all? Why not look for collected editions of everything? The simple answer is that good trades don’t exist for that full run to this day. If you want to read the Brood Saga, for example, there is no collection that will help you. More importantly, however, is that even if the trades had existed, when I read old comics I find the letter pages, editorial pages, and even the ads, important contexts for my reading of the comic series. I wasn’t going to do without them. As for digital editions, they’re a non-starter; I like the materiality of comics. All that being said, if I ever find affordable copies of some of those earlier issues I will snap them up. A friend even got me Uncanny X-Men #129 as a Christmas gift (or as I like to think of it, an X-Mas gift) a couple of years ago. Choosing where to stop the run was a lot easier: at the end of Fall of the Mutants. In fact, not even quite the end. I stopped one issue short: Uncanny X-Men #226. While back in 1988 I had a handful of post-Fall of the Mutants issues, they were in that sporadic period from the end of my collecting. None of them made an impression on me. I never even had Uncanny X-Men #227, which completed that storyline. The full experience of re-capturing the sense of my ideal X-Men reading era requires me not reading that final issue where the X-Men are resurrected. Instead, I wanted my run to end with the X-Men dying. The stack of all 82 issues of Uncanny X-Men, plus a few other issues including the X-Men and New Teen Titans crossover I got from a friend. So “complete” in this case means Uncanny X-Men #144 to #226. 82 issues. Add to that the handful of issues I associate with that run and thus made sure to also get: X-Men and Alpha Flight #1 and #2, X-Men Annual #9 and New Mutants Special Edition #1 (which together make up the Asgardian Wars arc) and it comes to 86. What are the Economic Logistics of Buying These Comics? As I said above, I try not pay more than $5 for any one comic book issue, no matter what it is, but I will fudge when buying lots. As long as all the comics average out to less than five bucks each I’m happy. I try to keep careful records of all my comics purchases, and I nearly succeeded with this run of X-Men. There are just a handful whose origins I cannot identify. It is possible I didn’t pay for them at all (comics fans can be very generous in swapping or giving away comics they have duplicates of) or that I picked them up in a lot with other comics from a used bookstore or warehouse sale and I lost track. There ended up being 10 issues total that I had to fudge in regard to determining how much I paid for them. So, since I acquired so many of these back issues from Midtown Comics online sales, I decided I’d treat these mystery comics as if I’d gotten them from there and assume I paid for the best versions available that were still less than five bucks. The truth is, I probably spent significantly less than five bucks for most of them, but I preferred erring on the side of paying more rather than less. With this gap in the data and workaround in mind, I figured out that I paid an average of $3.48 for each issue. This does not include the two issues I paid cover price for when I bought them off the newsstand back in 1985. It delights me that the average price falls below the common cover price for a new comic off the stands today (an overpriced $3.99). Still, this means I paid $299.39 to get comics that would have cost me $59.35 off the stands back in the 80s. But whatever…It’s worth it. What cannot be factored into this cost is the amount of time I spent looking for these comics, but even if I could find a way I’d be hesitant to do so because honestly hunting down comics is fun, even when it’s frustrating. While I had a few places I could regularly find new batches of back issues to look through both online and in person, the greatest frustration was at the very end of my hunt when Uncanny X-Men #221 was the only issue I was short. The issue (one that I owned back in the day) contains the first full appearance of Mister Sinister, a villain I probably couldn’t care less about in retrospect, because even though I was fascinated with the mystery of him and his marauders back at the time, nowadays I associate him with the excesses of the 1990s. Comic book speculation is absurd and eBay is a great place to see that absurdity in action. While it is possible to get lots of comics for cheap as heck, a good number are not only wildly overpriced, but my sense is that there is a cycle of buying to re-sell that consistently drives the prices up. As such, it took me months of bidding on auctions for #221 and slowly increasing how much I was willing to pay to acquire it. It became kind of a joke on Twitter for me to post that I had yet again been outbid on that issue. I took part in several dozen auctions before finally winning it. As for comic shops, in my experience the vast majority overprice their back issues. Twenty bucks was the least I saw Uncanny X-Men #221 going for at a comic shop, and I saw it stickered as high as $45. Conventions are the place to get deals, but you have to factor in the price of the ticket itself. What am I going to do with these comics? Read them, of course. The real question is: how will I read them? Storm losing her powers (I never had the issue, but I had #186, which is the one right after it, which I wrote about in the first part of my post series on Storm). I am also interested in finally filling those gaps and reading the stories I only ever heard about or read piecemeal when I borrowed comics from friends. I am interested in what these stories (both ones I last read about 20 years ago and ones I never read firsthand, but have heard about, read about, listened to podcasts about) might mean to me now and come to mean as I put them into relevant contexts and see what emerges. Among those contexts, of course, is how X-Men’s lauded cosmopolitics of radical difference play out in the era when I most closely followed the series. I am interested in paying attention to the artist changes for a run that featured the same writer for nearly two decades and see how the storytelling is affected. And of course, I am curious to pay close attention to that longform serialized storytelling as well and see if I can understand more about the appeal of Claremont’s dense, flowery, and vaguely angry style. I am interested in the letters pages and the responses of readers. There is plenty of data to be collected from these comics and their stories, most of which are in categories I cannot even name yet. But I already stumbled on one example. 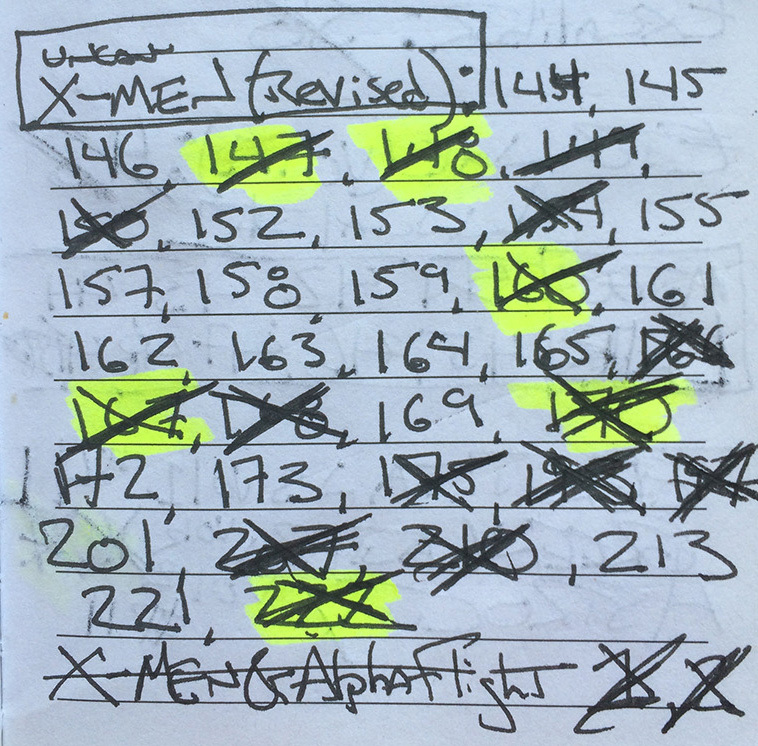 While browsing the covers of the 82 issues of Uncanny X-Men, I decided to keep track of how many times individual characters were featured, to see if my sense that Wolverine increasingly dominated covers in that era was based in fact. It turns out, that while Wolverine covers did become more frequent towards the end of my time as a regular reader and he was the most commonly featured character, his prominence on 14 covers is only one more than the number of times Storm was featured. After that, Cyclops and Kitty are tied for third place. Colossus and Rogue and Professor X come after that, with poor Nightcrawler only being featured once. The overwhelming number of covers (36) featured ensemble shots (3 or more characters gaining equal attention) or guest characters. Who knows what other data points I will discover and be able to account for as I read through and what revelations it might lead to. As I worked to reconstruct my Uncanny X-Men collection, I also found myself getting adjacent related series. So, I got a good long run of Excalibur (as Kitty and Nightcrawler were not among the X-Men who died). I have also started collecting The New Mutants and I have several related limited series from the era whose stories intersect with the main ongoing X-Men narrative to varying degrees. There is the original Wolverine limited series (which I also held on to from my original collection—I still remember trading for issues number #1 and #2 and buying the third and fourth off the stand). There is the Magick limited series, which I only owned a single issue of and never got to read all the way through. I even have a full run of Dazzler that I have written about before and was one of the first full runs I ever worked to get my hands on. I should probably consider getting Fantastic Four vs. the X-Men since I owned them as well and are a kind of coda to the consequences of the Mutant Massacre and Jay & Miles X-Plain the X-Men made it sound good. I probably won’t bother with the Kitty Pryde and Wolverine limited series unless I can find it for cheaper than cheap, but I have also been buying all the Classic X-Men reprint issues (later re-titled X-Men Classic) that include new art and dialogue to account for ret-cons, along with back-up stories by Ann Nocenti, that explore the relationships of characters and doing some retconning of their own. And of course, while doing all this reading I will also be reading supplementary material, like Joseph J. Darowski’s X-Men and the Mutant Metaphor: Race and Gender in the Comic Books (2014), The Best There Is At What He Does: Examining Chris Claremont’s X-Men (2016) by Jason Powell, and of course, The New Mutants: Superheroes and the Radical Imagination of American Comics (2016), Ramzi Fawaz’s amazing book that I keep find myself returning to. In other words, in addition to the simple enjoyment of indulging in some critical nostalgia, I hope these Uncanny X-Men and related books will be a trove of material to write about for The Middle Spaces and an opportunity to start and contribute to existing conversations about one of the most studied and talked about runs of a serial superhero comic of all-time. Overall, I am most looking forward to the pleasure of absorbing this years long serial I found so meaningful for (what seemed then) so long a time. In some ways, to re-read these issues of Uncanny X-Men will be to re-examine the framework I used to both understand my world and imagine my part in it in back then, both in terms of being part of a historically vulnerable population and projecting myself into the story of resisting a world that can not only “hate and fear you,” but can discount you completely. I am not so much interested in trying to recapture the feeling of reading these X-Men comics—not only does that seem impossible on its face, I know for a fact it is impossible based on my experience of re-reading them in the 90s—but in reflecting on the ways in which our understanding of such texts can change with not only time and circumstance, but with an understanding of its historical and cultural context distinct from personal experience. I can’t say when I’ll get around to writing about this monstrous run of Uncanny X-Men or even have a sense of how many different posts might emerge from this reading (it is very unlikely I will do a post series like I did for Howard the Duck or Omega the Unknown), but in the meantime you should follow on Twitter for updates and insights as I read. I also hope to include some more regular updates on what I am reading in the “Infrequent Middle Spaces Newsletter.” I am considering doing infrequent “Osvaldo Remembers the X-Men” themed posts on Notes from Comics Collecting, where I measure my rereading of a featured issue I owned back in the day against its memory. 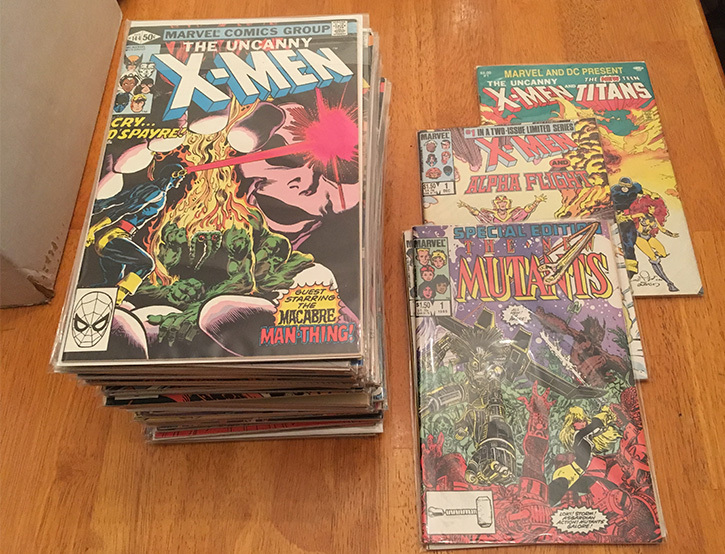 I also want to encourage readers to submit any questions about my collecting that come up in the future (about the X-Men or other series I am hunting/have hunted) through the Notes from Comics Collecting ask box. You can get your questions answered directly.